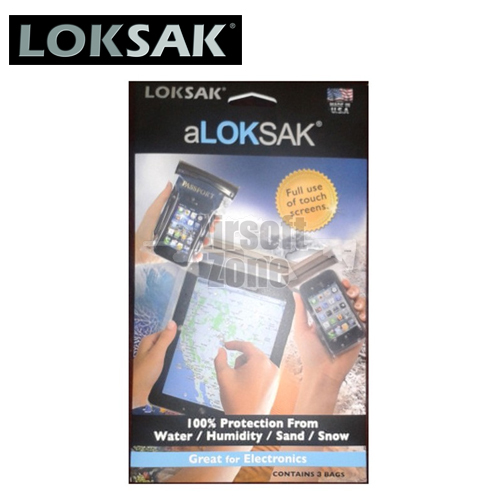 aLOKSAK¨ bags are resealable element-proof storage bags featuring a hermetic seal. That means absolutely no water, air, dust or humidity permeates the closure. They are designed for a wide range of applications and environments. The transparent bags are flexible and puncture resistant. They come in multiple sizes and can be sealed over and over again. The unique and patented materials, closure systems and manufacturing techniques used to fabricate the aLOKSAK meet the most rigorous testing standards. ¥Safe - Constructed using medical-grade film that is FDA approved. ¥Temperature rated -40F to 140F ¥Ecologically smart. Highly reusable and 100% made of recyclable Polyethylene. Typical items stored in our aLOKSAK. ¥ Domestic Uses ¥ NEW! Recommended on the Amazon blog to protect the Kindle reading device. Covers ONLY - phone, iPad & passport not included.